In today’s digital economy, the need to meet our customers’ rising expectations is causing a non-stop wave of innovation. In six years, Airbnb grew to one of the world’s largest hotel companies, without owning a single hotel. Uber and similar service providers slashed 65% of San Francisco taxi rides in only 15 months. 10M new autonomous vehicles per year could be driving on U.S. roads by 2030. Analysts predict that by 2020, 30 billion devices, appliances, machines and other physical objects will be connected and communicating over the Internet through embedded sensors. These objects are expected to generate 403 trillion gigabytes of data per year and this data will create $14.2 Trillion economic value per year. In simple terms, the world is changing and organisations need innovative systems and technologies to compete in the digital economy. Digital changes the world, and offers new opportunities and requirements for businesses in all industries. To stay ahead, you need to be able to offer new services, explore new markets and focus better on your customers. Don’t be held back by outdated enterprise systems that can’t support new business models and processes. What’s needed is an intelligent ERP system that supports transformation and delivers modern, intelligent capabilities that will deliver instant value and will grow with your business. Employee engagement – A lot of lip service is paid to the need for intuitive and seamless digital experiences for our customers, but these experiences are just as valuable when provided to your own employees. Through touchless, voice-activated, and automated technology, you can begin offering your workforce the engaging workplace experiences that allow them to focus on higher value tasks. Improving productivity – As the need for greater efficiency across every industry continually increases, organisations need the ability to improve productivity every year. According to McKinsey, digitally enabled advancements are unleashing the potential to create value equivalent to efficiency improvements of up to 20%. This is enough to completely transform value chains and profit models in any sector. Customer experience – This is perhaps the most vital factor. The entire end-to-end buying experience your customers go through needs to be completely reimagined and redesigned to take advantage of every innovative capability if you want to compete at the highest levels. This means looking at every step – from purchase to fulfilment to post-sales service. Leading businesses are digitally transforming their products, services and business models to not only meet their customers’ expectations, but well exceed them. None of the above is possible, unless your organisation can properly unlock the value within the data you collect today, and the new datasets you will be collecting in the future. 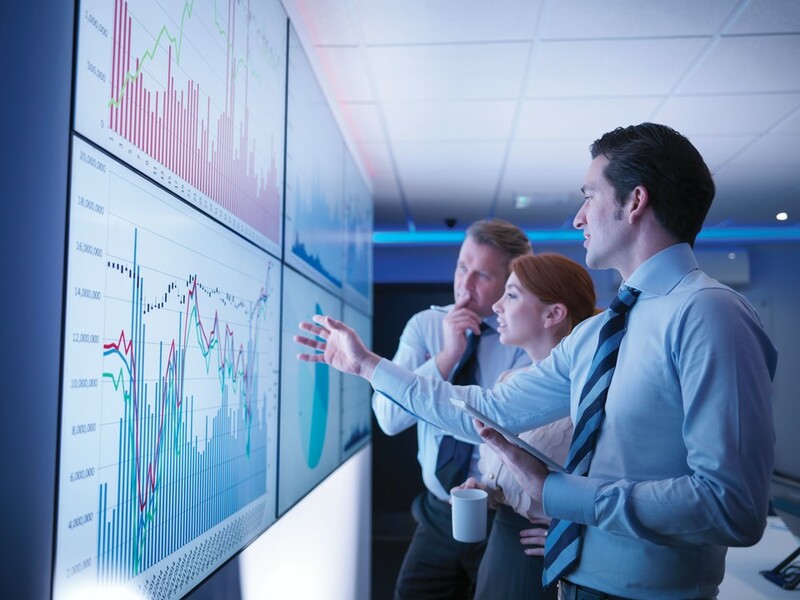 The businesses who reap the best returns from digital transformation are those who can most effectively convert the right datasets into intelligent insights – becoming the Intelligent Enterprise. The Intelligent Enterprise builds their knowledge and culture around the differentiated capabilities that innovative digital technology can provide. On the other end of the scale are organisations who are happy with the status quo. These organisations will become irrelevant because they lack the ability to innovate at the required pace because of siloed ERP, CRM and HR applications. To become a truly Intelligent Enterprise, organisations need the ability to tap into broad suites of applications that leverage cutting-edge capabilities such as IoT, analytics and machine learning. They also need a data-centric platform that enables them to seamlessly integrate these applications while automating and orchestrating end-to-end processes. We partner with a number of product vendors in this space, and SAP is one of them. 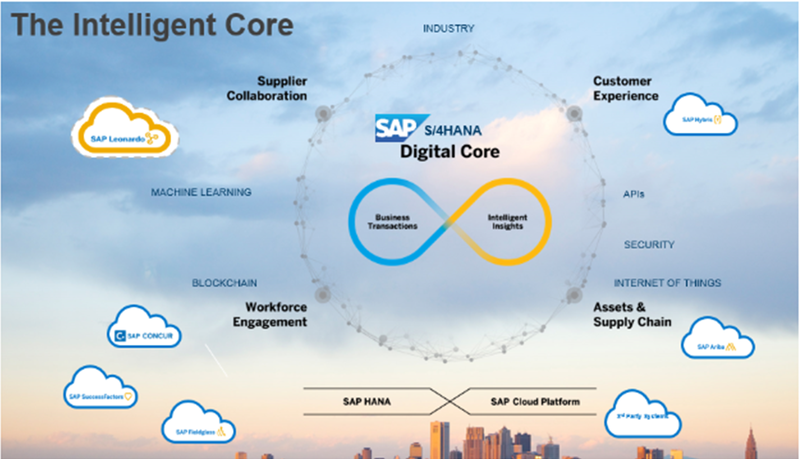 We have internally implemented the S/4HANA Cloud solution to run our business, and I would like to take SAP as an example to explain how an intelligent ERP System such as SAP S/4HANA can help your business to fuel the growth in the digital economy. How is S/4HANA different from a traditional ERP? Convert real-time data to intelligent insights. Help organisations to eliminate repetitive tasks and to focus on what’s important, by making intelligent suggestions based on business patterns and employee behavior. Drive smarter and faster decision-making. Create a simplified user experience with context-aware digital assistants. Drive continuous transformation and create differentiation with an ERP that is simple to use, configure and extend. 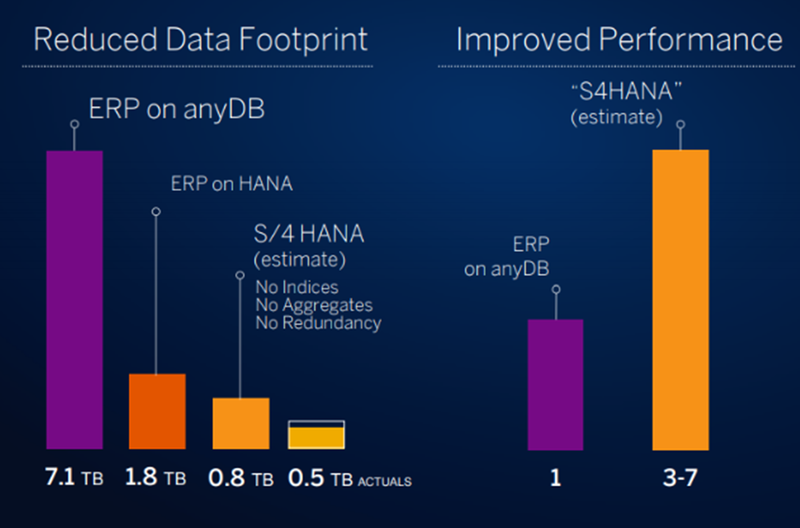 Following is an illustration of the database footprint reduction one of SAP’s reference customers has achieved with S/4 HANA. The businesses who reap the best returns from digital transformation are those who can most effectively convert the right datasets into intelligent insights. SAP S/4HANA acts as the digital core of the business and it supports Internet of Things (IoT), Machine learning, Big Data, real-time analytics, mobile, business networks, third-party systems and more. 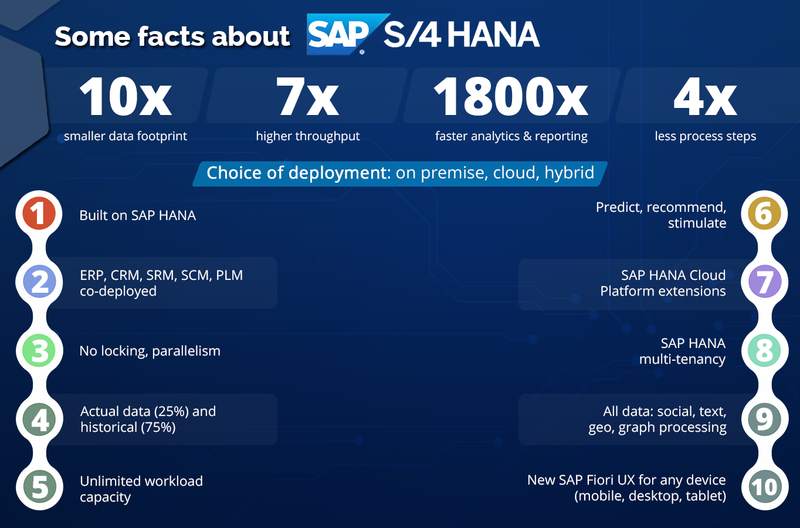 S/4HANA extends the solution to cover customers through C/4HANA (Formerly SAP Hybris), suppliers through SAP Ariba, employees through SAP SuccessFactors, Travel and expenses management through SAP Concur and analytics though analytical cloud etc. These functionalities bring together business processes and combined with analytics in real-time making the business smarter, faster and simpler. With SAP HANA Cloud Platform for the IoT, SAP offers a comprehensive solution portfolio that enables intelligence at the edge and automating processes at the core. Its foundation is the SAP HANA platform, which can process and stream unprecedented volumes of data in real time. The platform helps you process data of any kind of machine, device, sensor, or actuator – merging it with transactional business data, geospatial services, and unstructured information from social media. And with its predictive and analytics capabilities, you can take into account a variety of aspects to automate decision making, improve business operations, and react in real time. SAP has built several applications to enable process automation based on Machine Learning Capabilities Following are a few of those applications that are native S/4HANA applications or applications that can be integrated with S/4HANA. SAP predictive Maintenance – This application combines the business information in Enterprise resource planning (ERP), customer relationship management (CRM), enterprise asset management (EAM) and enables predictive maintenance. It uses IoT and machine learning capability to self-learn and automate processes. SAP Remittance advice extractor – This application automates the process of converting the Remittance advice into meaningful information for the accounts receivable team. It uses OCR and machine learning capabilities to improve the quality of the payment advice scan. SAP Cash Application – This application automates the process of reconciling incoming payments with open invoices. It learns from accountants’ past manual actions, and from customer-and country-specific behavior, all without the costs of manually defining detailed rules. Predictive Analytics for Contract Consumption – This native S/4HANA app for contract consumption predicts contract expiration or goods consumption ahead of time, which enables more effective supplier negotiations and relationships. 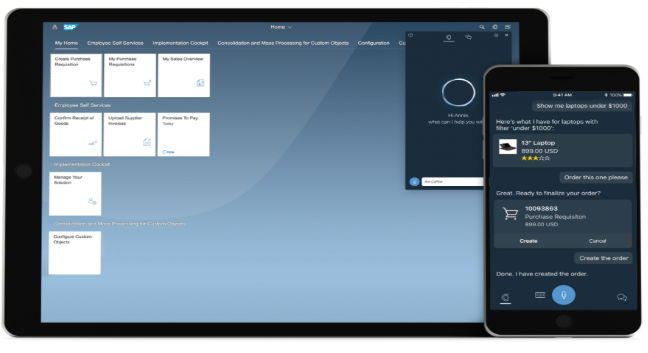 As a result of the SAP Predictive Analytics integrator, customers can now forecast contract consumption directly within the application and update the model using their own data, retraining with a single click. Predictive Analytics for stock in transit – This native S/4HANA app helps companies to track materials in transit/open stock transport orders for which no goods receipt has been posted by the receiving plant, yet which have already exceeded the estimated time in transit. SAP Business integrity screening – The software helps you identify anomalous activity quickly using flexible rule sets and predictive analyses that can help uncover potential fraud patterns. Partners and customers can also leverage the machine learning capabilities to build tailored and customized applications and services. SAP Co-pilot is a digital assistant and bot integration hub that allows you to accomplish tasks quickly in your business applications. You can add and create objects such as products, sales orders, and notes on the go by talking or typing to SAP Co-pilot. You can also use SAP Co-pilot on your mobile device, desktop, or through an external channel or platform. As a bot integration hub, you can integrate bots that you build using bot building tools such as SAP Conversational AI and SAP Co-pilot Skill Builder and connect them with SAP Co-pilot to create one seamless digital assistant experience. With AI, natural language and predictive analytics capabilities of S/4 HANA, your organisation will be able to completely reimagine the way your business is done. How Adita Technologies can you help you in the digital transformation process? Migrating your current architectures to the Intelligent Enterprise is a considerable undertaking. The team at Adita Technologies can help you accelerate this implementation process with our flash implementation packages, allowing you to move to an intelligent ERP of your choice within a reasonable timeframe of 12 to 26 weeks (based on scope), providing you with a lean enterprise architecture that is low cost and data-driven and the architectural agility for staying relevant in a digital economy. As the CEO and Chief Architect at Adita Technologies, my team and I work to understand our clients’ critical business processes and strategy so that we can develop a digital transformation roadmap towards implementing intelligent ERP, CRM and Marketing Automation within their business. If you’d like to discuss how your business can take the next big step in your digital transformation in order to discover a new competitive advantage, please feel free to get in touch with me on +61 405 981 679 or at kumar@www.aditatechnologies.com.